Recruit Isran's old allies for the Dawnguard. Master trainers in Smithing and Marksman. Find Gunmar and help him defeat the bear. Find Sorine Jurard and get her to come to Fort Dawnguard. Return to Fort Dawnguard and listen to Isran's speech. When you have declined Lord Harkon's offer at Castle Volkihar, you are told to return to Isran at Fort Dawnguard and provide information about Serana. 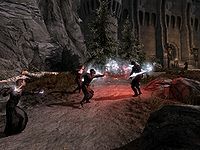 Upon arriving in the courtyard, you will find Isran, Celann, Durak, and newcomer Vori doing their best to fight a group of attacking vampires. Help them defeat the vampires, then report back to Isran who will be waiting at the main gate, showing great anger that his hidden fortress was exposed so soon. When you tell him that the vampires were looking for a woman trapped inside Dimhollow Crypt, he will say: "A woman? Trapped in there? That doesn't make any sense. Who is she? More importantly, where is she?" However, he will forget about the woman once you tell him the vampires claimed an Elder Scroll: "By the Divines, this couldn't get much worse. This is more than you and I can handle." He will then realize it is time to bring in some powerful reinforcements to Fort Dawnguard: "If they're bold enough to attack us here, then this may be bigger than I thought. I have good men here, but... There are people I've met and worked with over the years. We need their skills, their talents, if we're going to survive this. If you can find them, we might have a chance." He will then tell you about the two persons, namely Sorine Jurard and Gunmar: "I think we'll want Sorine Jurard. Breton girl, whip-smart and good with tinkering. Fascination with the Dwemer. Weapons in particular. 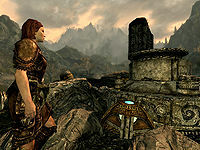 Last I knew, she was out in the Reach, convinced she was about to find the biggest dwarven ruins yet. You'll also want to find Gunmar. Big brute of a Nord, hates vampires almost as much as I do. Got it into his head years back that his experience with animals would help. Trolls in particular, from what I hear." He will then send you on your way, and you will have to convince Sorine and Gunmar to join the Dawnguard, and use their special skills to help out against the vampire menace. There is always one specific bear you will have to kill, although you will often get in battle with several creatures at once. 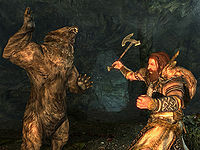 When the bear is dead, a journal update will tell you to speak with Gunmar, who will thank you for the assistance, and agree to help against the vampires: "You've helped me, so I suppose the least I can do is find out what Isran wants. He's still at that fort near Stendarr's Beacon, I assume?" He will then be on his way to Fort Dawnguard. Sorine Jurard will turn up in the wilderness near an unmarked Dwemer convector, just south of Mor Khazgur. She will be drifting around, obviously looking for something, mumbling: "What would mudcrabs want with my satchel, anyway?" and "Just one gyro. One, and I can get back to work. Where are they?" When you talk to her, she will ask if you have seen a sack full of Dwemer gyros and will proceed to tell you that a mudcrab may have taken it. When you tell her that Isran needs her help, she will respond: "Isran? Wants me? No, you must be mistaken. He made it exceedingly clear the last time we spoke that he had no interest in my help. I find it hard to believe he's changed his mind. He said some very hurtful things to me before I left." When told about the vampire threat and the Elder Scroll, she will change her mind, although she will not do anything before she gets a Dwemer gyro. You can now choose between two options, although the second option will differ if you already have a Dwemer gyro in your inventory. If you do, you can hand it to her and she will be on her way to Fort Dawnguard. You can also choose to persuade her, although you need a Speech skill of 50+ to be successful. If everything else fails, you can look around for her satchel, which can be found on the shore a few feet south of where Sorine stands. When you return to her with one of the gyros she will finally be convinced and walk all the way to Fort Dawnguard for an encounter with Isran. 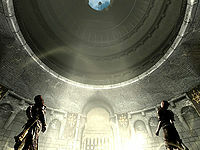 Once Isran has removed the barrier, the quest will end and the next quest, Prophet, will initiate. Gunmar and Sorine will then find their respective spots in the western area of Fort Dawnguard. Their presence will net you several benefits. Sorine is a master trainer in Marksman, and will also sell and buy items. She will also hand you several quests, while Gunmar is a master trainer in Smithing, will sell and buy weapons and armor, and will sell you an armored troll to aid you in battle. If there is no quest marker for Gunmar and Dragonborn is installed, the radiant location might be in Solstheim. If so, traveling to Solstheim will result in the marker appearing normally at that location if the quest is active. Sorine makes a comment that she saw a mudcrab the other day while discussing where her gyros have gone. This is likely a subtle reference to the previous installment, Oblivion where "I saw a mudcrab the other day" was a sentence commonly uttered by many NPCs. If you are a vampire, Isran will stop his speech and ask you to get yourself cured before anything else happens. This means that Sorine and Gunmar will wait in the main hall until you have completed Rising at Dawn. You may randomly encounter a vampire assassin at any point after completing this quest. If you clear the bear den before talking to Gunmar, he will just stand there telling you to slay the (dead) bear. Upon entering the fort, Gunmar and/or Sorine may end up behind the instantly-closing gate, making it impossible to continue the quest. Exiting and reentering the fort or using the wait function will sometimes fix this and trigger the quest completion. Open the console, click on each NPC and type moveto player one at a time to bring them to your side of the gate. 20 I've rejected Harkon's offer to be turned into a vampire. Now I need to return to Isran and tell him what I've learned. 30 I've told Isran what I learned at the vampire castle. Isran has asked me to find Sorine Jurard and Gunmar, and bring them to him. 70 I've found the people Isran said we'd need to fight Harkon and his vampires. Now I should return to Isran and help him formulate a plan of attack. 200 Finishes quest After rejecting Harkon's offer to become a vampire, I returned to Isran and informed him of what I've learned. I helped him recruit several people into the Dawnguard who can help us fight the vampires. The following empty quest stages were omitted from the table: 0, 10, 40, 50, 60, 255. On the PC, it is possible to use the console to advance through the quest by entering setstage DLC1HunterBaseIntro stage, where stage is the number of the stage you wish to complete. It is not possible to un-complete (i.e. go back) quest stages, but it is possible to clear all stages of the quest using resetquest DLC1HunterBaseIntro. This page was last modified on 20 April 2019, at 15:27.